For you who like water world, especially diving or snorkeling in the sea, it’s time for you tried dinner or sleep in the water and you don’t need to be afraid to get wet or submerged. Hilton Maldives Resort & Spa Rangali Island is the first underwater hotel and restaurant in the world built at 5 meters depth of Indian Ocean. This luxury resort is made ​​to resemble small hall with plexiglass glass materials that are resistant to high pressure, vibration and scratch in order to ensure safety for guests. 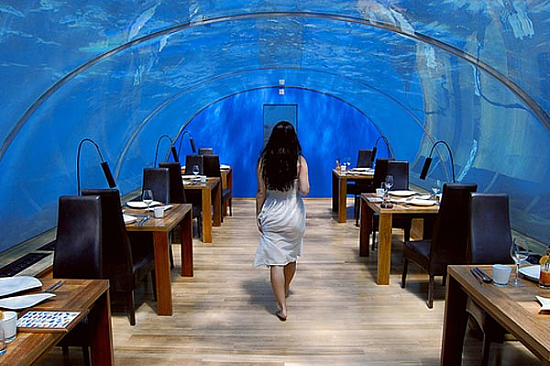 There are 14 exclusive seats for you who want to eat while enjoying the charm of fish that swim around you. Favorite menu of this restaurant is Maldives Fusion or Maldives local food are made ​​from fresh tuna flavored with European sauce. In addition to the restaurant, you can also rent a private room for two people complete with exclusive bedroom, champagne, music and delicious breakfast at sunrise. And here HomeTrendy.org provide photographs amazing deep sea landscape as seen from the Hilton Maldives Resort & Spa Rangali Island. Home Design Hilton Maldives Resort & Spa Rangali Island. permalink.